The Morpheus team has been hard at work preparing for this year’s series of tests and building the new Morpheus 1.5B and 1.5C vehicles. We have been busy assembling the vehicle structures, wiring in all of our sensors, running integrated tests, continuing engine firings at Stennis Space Center, and more. running simulated Morpheus flights at KSC. The Morpheus and ALHAT teams are now a combined team, which enables a more integrated series of tests as we prepare for future flight tests. One of these integrated tests took place at Kennedy Space Center in December. We used a Langley Research Center Huey helicopter as a stand-in for Morpheus. 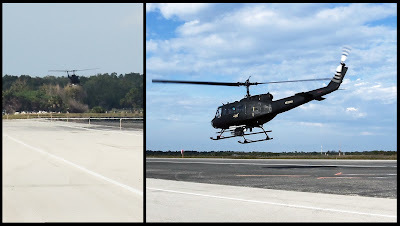 We mounted the ALHAT sensors under the belly of the helicopter pointed in the direction of the helicopter motion. Other components such as sensor electronics, Morpheus flight computer, real-time communications equipment and support hardware were placed in the passenger/cargo area. This allowed both onboard and ground support teams to monitor progress in real-time. The helicopter was flown repeatedly on Morpheus-type trajectories towards the hazard field.